American lunar orbiter. Pioneers 0, 1 and 2 were the first U. S. spacecraft to attempt to leave Earth orbit. Status: Operational 1958. First Launch: 1958-08-17. Last Launch: 1958-11-08. Number: 3 . Gross mass: 38 kg (83 lb). Height: 0.77 m (2.52 ft). Propelled by the U. S. 's desire to beat the Soviet Union to the moon, each of the three vehicles was designed to go into orbit around the Moon and photograph the Moon's surface. None of the vehicles accomplished its intended mission, although some useful data was returned. The first vehicle, Pioneer 0, was launched by the USAF and was destroyed 77 seconds after launch when the rocket's first stage exploded. Following this attempt, Pioneer 1 and Pioneer 2 were turned over to United States' newly formed National Aeronautics and Space Administration (NASA). Pioneer 1 was the first spacecraft launched by NASA. A programming error in the Pioneer 1 launch vehicle upper stage resulted in Pioneer 1 being given insufficient velocity to escape the Earth's gravitational field. Although lunar orbit was not achieved, it did reach an altitude of 113,854 km above Earth and provided data on the extent of the Earth's radiation belts. The vehicle re-entered over the Pacific Ocean 2 days later. 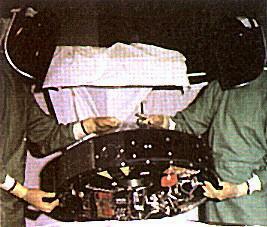 Pioneer 2 also suffered a launch vehicle failure and re-entered the Earth's atmosphere 6 hours and 52 minutes after launch (it did not return any significant data). The spin stabilized spacecraft used a paint pattern for thermal control of the multi-instrument payload. A retro-rocket was to have allowed lunar orbit insertion if the moon had ever been reached. The payload included a TV camera, magnetometer, micrometeoroid impact detector, and radiation detector. Pioneer 0, 1, 2 Lunar lander built by TRW for USAF, NASA, USA. Launched 1958. Family: Lunar Orbiters, Moon. Country: USA. Launch Vehicles: Thor, Delta, Thor Able, Thor Able I. Projects: Pioneer series. Launch Sites: Cape Canaveral, Cape Canaveral LC17A. Agency: NASA, USAF, TRW. Bibliography: 126, 2, 6, 12956. 1958 August 17 - . 12:18 GMT - . Launch Site: Cape Canaveral. Launch Complex: Cape Canaveral LC17A. LV Family: Thor. Launch Vehicle: Thor Able I. FAILURE: Thor exploded after 77 sec.. Failed Stage: 1. Pioneer (1) - . Payload: Pioneer / Able 1. Mass: 38 kg (83 lb). Nation: USA. Agency: USAF. Program: Pioneer. Class: Moon. Type: Lunar probe. Spacecraft: Pioneer 0-1-2. Decay Date: 1958-08-17 . Apogee: 16 km (9 mi). An Air Force Thor/Able It launch vehicle, carrying the first U.S. International Geophysical Year (IGY) lunar payload, exploded 77 seconds after liftoff from Cape Canaveral because of a first-stage engine failure. First US lunar attempt. The first US Air Force lunar probe, using a Thor-Able booster. An explosion ripped it apart 77 seconds after launch. 1958 October 11 - . 08:42 GMT - . Launch Site: Cape Canaveral. Launch Complex: Cape Canaveral LC17A. LV Family: Thor. Launch Vehicle: Thor Able I. FAILURE: Third stage produced insufficient thrust. Partial Failure.. Failed Stage: 3. Pioneer 1 - . Payload: Pioneer 1 / Able 2. Mass: 38 kg (83 lb). Nation: USA. Agency: NASA. Program: Pioneer. Class: Moon. Type: Lunar probe. Spacecraft: Pioneer 0-1-2. Decay Date: 1958-10-12 . USAF Sat Cat: 110 . COSPAR: 1958-Eta-1. A Thor/Able launched the NASA Pioneer I, the first successful space probe, to a new altitude record of over 70,000 miles. AFBMD provided the vehicle and launched it under NASA direction. Set distance record; failed to reach moon..
1958 November 8 - . 07:30 GMT - . Launch Site: Cape Canaveral. Launch Complex: Cape Canaveral LC17A. LV Family: Thor. Launch Vehicle: Thor Able I. FAILURE: Third stage ignition unsuccessful.. Failed Stage: 3. Pioneer 2 - . Payload: Pioneer 2 / Able 3. Mass: 39 kg (85 lb). Nation: USA. Agency: NASA. Program: Pioneer. Class: Moon. Type: Lunar probe. Spacecraft: Pioneer 0-1-2. Decay Date: 1958-11-08 . Apogee: 1,550 km (960 mi). Pioneer 2 was launched from the Atlantic Missile Range, using a Thor-Able booster, the Air Force acting as executive agent to NASA. The 86.3-pound instrumented payload, intended as a lunar probe, failed to reach escape velocity..